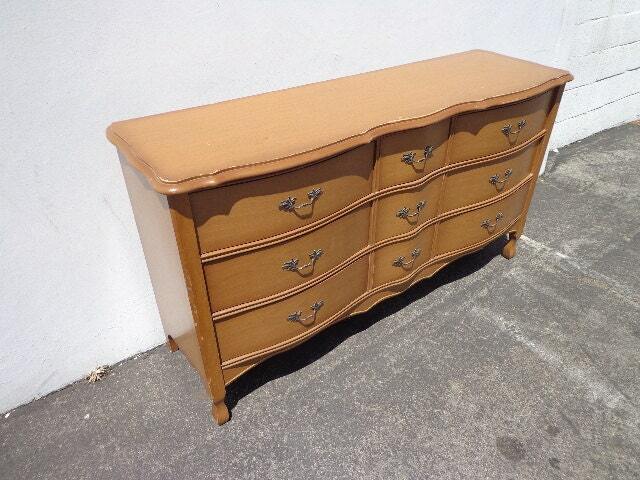 Classic country French Provincial chest of drawers / buffet / sideboard / cabinet. 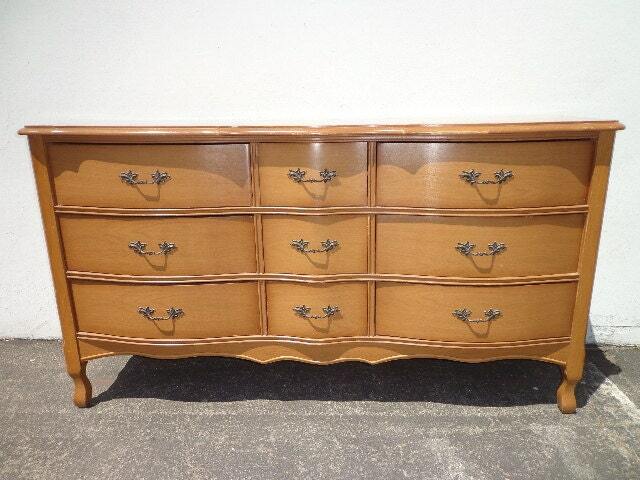 This piece was expertly crafted and brilliantly designed with gorgeous lines and character. Attractive edging special details make this elegant and timeless. All 9 dovetail drawers pull smoothly with all original hardware intact. This piece is truly unique and one of a kind. 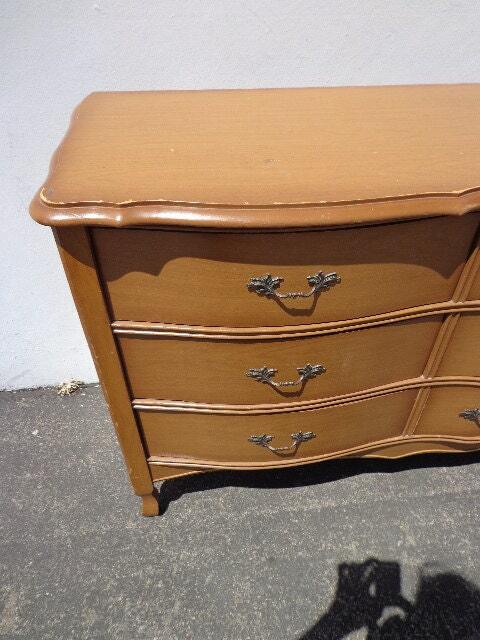 Overall good vintage condition, shows surface wear from age/use. Shows heavy surface wear from age/use and will benefit from refinishing. Extremely solid and sturdy frame. 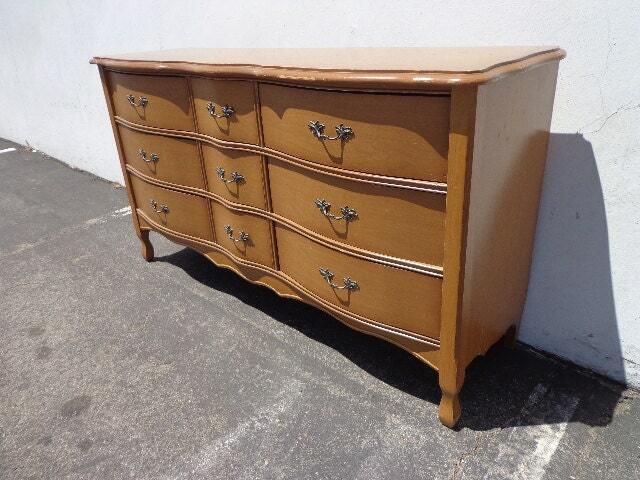 Perfect piece to refinish and paint, lacquer, chalk paint, distress, whatever your preference is ->make it your own! Will be the focal point of any bedroom and will last a lifetime. Measures: 59" x 17 3/4" x 32 1/2"
We accept PayPal, credit card payments via direct checkout through Etsy. There will be no refunds. Please read all item descriptions and our policies prior to purchasing as there will be no refunds. If we make a custom order for you, there will be no refunds at all on the custom order fees. We use several different shipping methods including professional white glove shippers, Plycon, and FedEx for small items and decor. Our goal is to provide the most economical & timely shipping to our customers. For larger items such as furniture and lamps, all shipping is an estimate and shipping fees could change based on destination of the item. Please understand that shipping large furniture can be costly and takes time and, depending on the shippers planned route and stops, may take 2-8 weeks. We have negotiated very reasonable rates with several white glove shippers, however, their transit times may be longer than others -note that we do not set the shipping prices and delivery time – they are provided to us by the shipping company and we cannot be held responsible for rates or delays from a 3rd party. You will have direct access to the shippers and we will email you with all updates that we receive. They will also be in contact with you, prior to making the delivery. 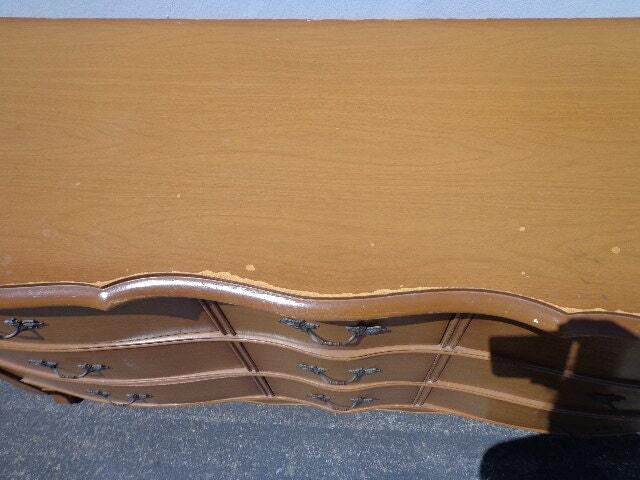 The white glove shippers are all rated and reputable, professional antique and vintage furniture movers. They provide door-to-door shipping. After you convo us with your location/ZIP code, we will let you know how much your shipping fee will be. Your items will be prepped, packaged and shipped and we will provide all contact and/or tracking information. If you need your purchase "rushed" please indicate this and we will try to accommodate your request but keep in mind "rushed" shipping will cost more. If you are local, free pick up is also available. Please note that after 30 days (from purchase date) if the buyer does not contact our shop or pay/arrange for shipping the buyer forfeits their purchase & item with NO REFUND or RETURN. There will be no refunds on any items, so please read all "estimated" measurements and review all pictures carefully and ask any questions or concerns you might have before purchasing the item. If the item is damaged during shipment, the SELLER IS NOT RESPONSIBLE! The shipper is a separate business and they are accountable for transporting the furniture in the same condition they picked it up in. We try to describe our items as accurate as possible. We offer high-end vintage at a great price. Once the item leaves our warehouse we cannot be responsible for how its handled. We package things very well for the journey. We do not offer refunds. Please raise any questions or concerns before you place your order. Thank you! Thank you for stopping by our shop. If you would like any of our pieces painted, please convo us with details of what you would like done. The price for a painted piece is higher than the "As Is" price unless we agree otherwise. These are vintage and antique pieces, some are quite old, so please understand these will not be perfect "brand new" looking pieces. They are for that "special buyer" who appreciates the age, history, and patina of an old hardwood piece! These are not brand new pieces. So if you need additional photos or more details on an item, please contact me so that you know what you are buying. Based on this information, all sales are final.